This entry was posted in Hollywood liberals, Liberals/Democrats/Left and tagged Barbra Streisand plastic surgery. Bookmark the permalink. She’s waiting for President Trump’s re-election (2020) to move out of the country. Hey Babs, New Zealand or bust! Streisand never was a real beauty. When she appeared in films–she was heavily made-up, and had gloriously designed clothing . . . giving the illusion that she was a beautiful woman. She did however had quite the voice. So like 2nd hand Rose she now has a 2nd hand face. The attitude within always finds a way of coming out and shining through. Although, regrettably, it looks to me like Babs has a bad aura. Her pronouncements over the years—including yesterday’s most recent “Michael Jackson had real sexual needs”—indicate a deep despair and nihilism that comes from a life without Logos, a life without—I will say it—GOD. 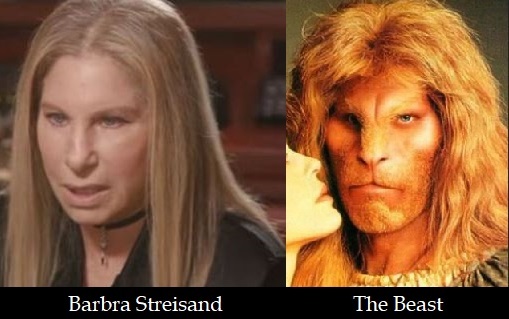 What religion led Barbara Streisand to the sad state of affairs she is in? Certainly not Traditional Roman Catholicism. I’ve always found her homely, now she’s becoming increasingly ghastly. You wonder sometimes where the costume and makeup department of production companies get their inspiration…just sayin’. She is everything you say, Steven, but worst of all, she’s a demonrat. Ron Perlman is an avid Trump hater, the one who played The Beast.